Every countertop needs some type of backsplash. Most countertop surfaces can only offer the standard 4" high, loose piece of backsplash with few design options. Solid surface on the other hand, offers an endless range of backsplash design ideas. Because of the seamless attributes of solid surface, mixing and matching two or three backsplash treatments is simple and cost effective. 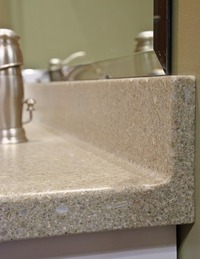 Here is a brief review of the variety solid surface brings to the backsplash. 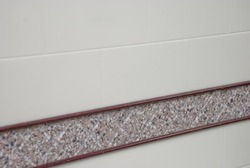 The picture demonstrates how a tile cove backsplash is fabricated to accept tile or any other vertical wall surface. Typically it is called 3/8" tile cove, meaning the top edge of the tile cove is 3/8" wide. When 1/4" tile is installed on top of it, you are left with a slight reveal. The thickness of the tile determines the width of tile cove ledge. Using tile cove as a foundation for the tile serves a couple purposes. It makes for a clean and classy, almost seamless transition to your worktop, makes for easier cleaning, and reduces the chance of moisture getting behind the countertop and cabinets. Cove backsplash has many attributes and flexibility to give you the complete custom built-in look. The backsplash is integrally fused to the worktop forming a smooth, one piece splash and top. Do you have a curved wall? No problem. Need to go around a few corners? Done. 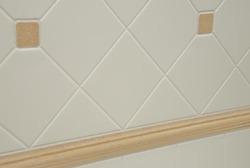 And when you add a scribe strip to the back of a 3" or 4” cove backsplash, with proper templating your cove backsplash can follow any wall irregularities and provides a custom built-in look. One of the more exciting backsplash treatments in recent years is full height backsplash. 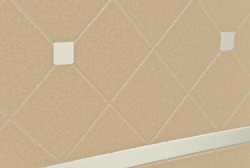 An interesting technique is to use solid surface to simulate tile and grout lines. This is accomplished by using a computer controlled router (CNC). Virtually any design can be routed into solid surface. Below are just a few examples. 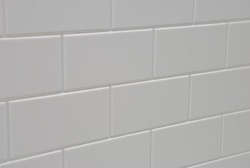 You can see how it is possible to get the look of tile and grout lines, but without dirt build-up or the need for sealing. Accents can be added as well to enhance the look. Most of the time when a full height solid surface backsplash is used, it is installed on top of tile cove. When seamed, you have a virtually waterproof and easy to clean worktop area. This application can also be added to any counter surface from granite to engineered stone, making for some striking contrasts. Solid surface backsplash adds value to your countertop through appealing designs and ease of living.